The deal is done. The Louvre and Rijksmuseum have come into shared ownership of Rembrandt’s earliest full-length, life-size portraits. Buyers and sellers proclaim piously that they were driven by angst that these cultural treasures might disappear to Arabia or China. Schwartz tests that proposition and finds it wanting. Yesterday, 1 February 2016, the deal seems to have been signed, sealed and delivered. Why is this argument so bad? For one thing, rich oil sheikhs have had a century or so to show interest in buying Rembrandts, and none of them ever has. Rembrandt paintings and drawings are bought in the Western world, Australia and Japan and nowhere else. That is not the only thing. There is a second one, much worse: for all the chance Bussemaker’s precious public has had to see those full-length, life-size portraits since they came into the possession of the Rothschild family in 1877, they might just as well have been in a bank vault in Abu Dhabi. To my knowledge, the last time they were lent out for an exhibition was sixty years ago, in 1956. They are said to have hung in the bedroom of the seller and his wife. The sellers are Eric de Rothschild and – as NRC Handelsblad reports today – his brother Robert, whose financial needs were the occasion for the sale. When a while ago the rumor began to spread that the van Loon family wished to sell [the collection], the Dutch government opened negotiations concerning a purchase. However, they are said to have met little cooperation from the owners, either because they could not agree on the price, or because the gentlemen concerned were in too much of a hurry. The government would of course have had to submit draft legislation, which would have taken a lot of time, while we hear that Rothschild posed the condition that he had to make payment within three weeks and in the same period have the paintings taken away. 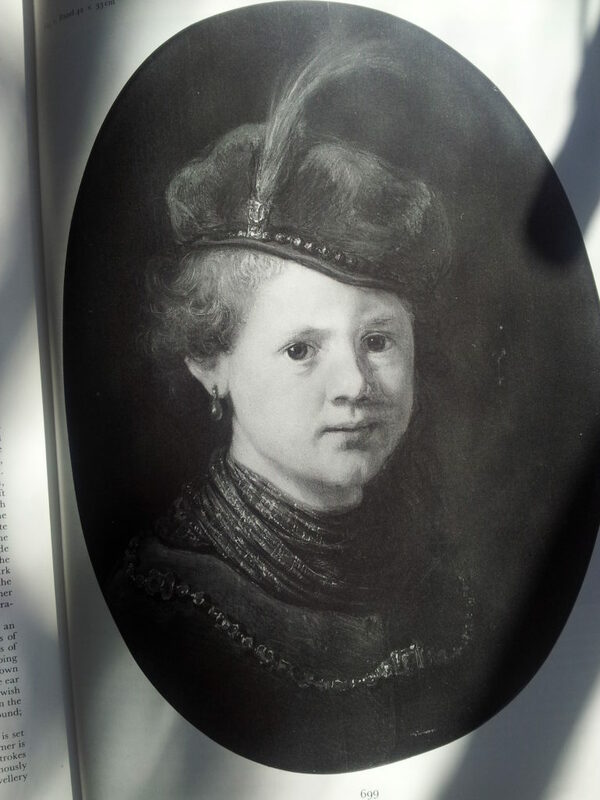 Rothschild owners of Rembrandt paintings have a mixed record when it comes to sharing their treasures with the public. Panel, 42 x 33 cm. Since it was acquired in 1865 by James Baron de Rothschild (1792-1868), Paris, this painting never seems to have been displayed in public. (An unfortunate deficiency in the massive Corpus of Rembrandt paintings is that the entries do not include exhibition history or complete literature. Nor is the provenance information in the early volumes very good.) The Rembrandt catalogue authors Kurt Bauch (1966) and Horst Gerson (1969) never saw it, though it was examined in April 1971 by Joos Bruyn and Simon Levie of the Rembrandt Research Project. It is one of a group of paintings that Willem Martin, in 1921, disparagingly called “children with calf eyes.” Still, it would be nice if people could see it and make up their own minds about its quality. I have never even seen a color reproduction of the painting. Oil on panel, 73.5 x 55 cm. Purchased in 1837 by the Dutch art dealer Arnoldus Brondgeest (1786-1849), after whose death it is recorded in the collections, successively, of Baron Anthony de Rothschild (1810-1876), London; Baron Alphonse de Rothschild (1827-1905), Paris; Baron Edouard Alphonse James de Rothschild (1868-1949), Paris and London; and Bathsheva de Rothschild (1914-1999), Paris, London and Tel Aviv. An equally poor exhibition history, for as long as it belonged to four succeeding generations of Rothschild owners, was chalked up by a portrait of a woman now identified by Jaap van der Veen as an older cousin of Rembrandt’s wife Saskia. After the death of Bathsheva de Rothschild, an admirable patron of ballet in Israel, it was sold at auction and bought by the Maastricht art dealer Robert Noortman. Seeing it at his stand at TEFAF in 2000, I was stunned by its magnificent condition. It became the standard against which I judged the material integrity of other Rembrandt portraits, especially those of sitters dressed in black. Could this have been the result, at least in part, of benign neglect on the part of its owners? Noortman sold Aeltje to the most generous collectors imaginable, Rose-Marie and Eijk de Mol van Otterloo. It is now a regular display at Rembrandt exhibitions. Canvas, 118.8 x 96.8 cm. For 176 years the Rothschilds have successfully conspired to keep the ownership of this important painting a family secret. Over and against this secretiveness is the emphatic identification of the Rothschild whose collection of prints and drawings was donated to the Louvre after his death, Baron Edmond de Rothschild (1845-1934). Among the phenomenal 40,000 works on paper in his collection were 385 etchings and eighteen drawings by Rembrandt. By the terms of the donation, to this day the Collection Edmond de Rothschild is preserved as a separate entity within the print room of the Louvre, with its own curator and researchers. The baron was especially attached to his Rembrandts, to which he devoted a room of their own in his “art shed” on the rue Faubourg Saint Honoré. The collection started with a bequest of forty-some etchings from Edmond’s father Jacob James de Rothschild (1792-1868) and continued for more than sixty years with purchases from some of the best collections that came on the market. Edmond de Rothschild and his children earned the right to the everlasting credit the Louvre still pays them. Back to the the Soolmans-Coppit portraits. By the account in NRC Handelsblad of 2 February 2016, the fear that they would end up in alien hands was put into words by Eric de Rothschild. “I did not want them to end up hanging on a wall in Shanghai or Mecca where no one could see them.” This from a seventy-five-year-old who was sixteen the last time his family or he showed the paintings to the public. There’s a word for this in our language, Eric’s and mine: chutzpah. Yesterday, 1 February 2016, the Bosch Research and Conservation Project (BRCP), in conjunction with the Noordbrabants Museum in Den Bosch and the Nelson-Atkins Museum of Art in Kansas City, announced that a “Bosch School” painting of St. Anthony in the Nelson-Atkins cellars can reliably be attributed to Jheronimus himself. The painting is now in Den Bosch, where it will be displayed in the coming exhibition opening next week in the Noordbrabants Museum. There are more than 150 paintings in the situation of the St. Anthony – sixteenth-century paintings that make you think immediately of Bosch but fall off on closer consideration. The BRCP cannot have examined them all. Whatever led them to make the trip to Kansas City last September (see the Nelson-Atkins press release), it was a good hunch. The fragment they inspected turned out to show a sufficiently convincing array of Bosch features, on and below the paint surface, to justify a renewed attribution to the master. Always a pleasure to read your columns!